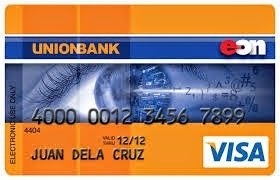 The EON Debit Card will most probably be the best product of Unionbank for me. I have no credit card so I find it hard to apply for Paypal but thanks to this product, now I can! My application for the EON Card actually took me just hours! It’s fast, convenient and efficient! Tip: Apply Online!!! Do not attempt to go to the Unionbank and Apply there for it will take you 1 week before you can claim your EON Card!!! Step 1: Fill up the Online Application. This can be easily done in the Unionbank Website, Just click the EON Apply Online Link. Step 2. Once you have fill up the online application you will be getting an email confirmation that contains your reference number and preferred branch for claiming. Have a copy of this by simply writing it on a note pad or print screen the email on your phone. Step 3. Go to the Unionbank Branch of your choice. You can immediately do this once you have received you have received your email confirmation. Just make sure that you go the branch that you indicated. The email you will receive from EON Team. present it to the Unionbank teller. Step 4. Prepare 2 Valid IDs. The list of Valid IDs are located here. And 350pesos as an annual fee and initial account opening fee. Tip: If you are employed, prepare an ID that contains the same address within the branch of your choice. Example: I work along Rufino Plaza, Makati so the branch I enrolled is in Unionbank Rufino. The teller herself requires me to present an ID that has the address of the company within Makati. She insisted that it is regulation of Unionbank for EON Cards. Beware because they will not release your EON Card without this ID, again based on my experience. Step 5. Go personally to the Unionbank branch of choice. Ask the guard who is the best person to talk to about EON release. Once talking to the Sir or Lady, present your Reference Number and your 2 IDs as well as your company ID. Tip: No need to photocopy your IDs for the Unionbank will be glad to photocopy your identification cards. J But for your peace of mind you can prepare so. Step 6. Wait for the further instructions given by the Unionbank teller. It should take you not more than 20mins for the whole process. That is the good thing when you apply online for they already have your application in their system’s database. All you have to do is wait. Step 7. Sign on the paper and hand in your 350pesos initial annual payment. Your physical card will be yours at that time. They will also give you your initial PIN. PS. The teller told me that it is important to give the correct address for your online application for there will be a thank you mail that will be sent via certain courier. If you are unable to receive this mail then your application will have major problem. PSS: If you are from Taguig City, Taguig will not appear in entry of your address for the post code verification. Type Bicutan instead for it has Bicutan/Taguig.